I don’t eat in fast casual restaurants often, so I was skeptical when I stepped into Café Mexicali’s last night. I was pleasantly surprised. Their menu has a wide variety of meat and vegetarian options. 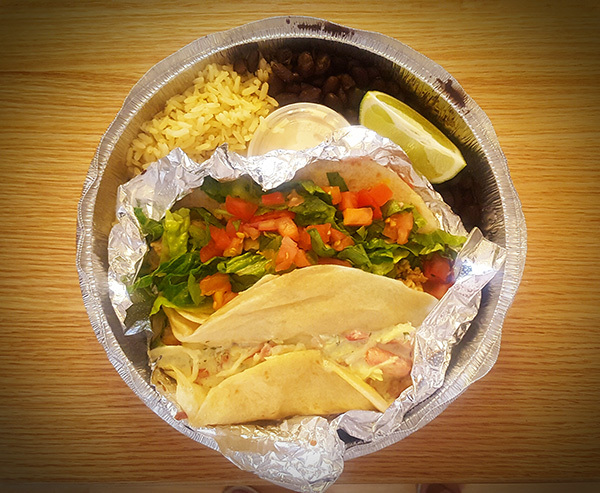 I chose the fish and chicken soft tacos, with tomatillo rice and black beans instead of pinto. The gentleman who took my order apologized for the 10-minute “delay” on the fish because each dish is prepared fresh per order. I was delighted. I took mine home, so I could enjoy a chilled glass of Sauvignon Blanc with my meal. When I opened the container, I was again surprised by the way it was neatly packed so that everything remained fresh and flavorful. As an added bonus, the aluminum tin and plastic container for the chipotle sour cream were both recyclable. The beans tasted like they had been cooked slowly, not popped from a can and reheated. The lettuce and tomatoes were freshly diced and shredded. The chicken was moist and lightly seasoned. The fish had a tangy sauce over top. Nothing was overly salted. For just over $10, I had a delicious, healthy meal that I could grab on the go. I’ll be back!